Decent propagation, actually better than expected. 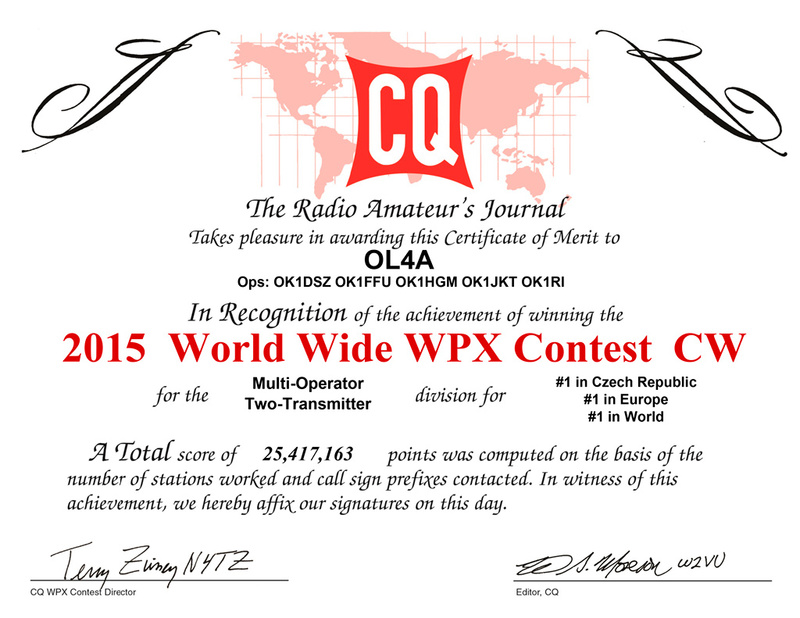 We knew we can not compete with the stations in the west/southwest – like EA, CT, EI, TM69M etc. It is simply different world. I know well from a couple of operations from CS2C. We had sort of local competition with our friends at OL7M – they were M/M and we did hope we could – with our better setup beat them in M/2 – well we did not made it. The first night with decent propagation on 4 bands just prohibited the goal. We lost there close to 450 QSOs – decreased that to about 200 until the end. Anyway we had fun and that is what counts. Looking forward to the SSB leg. This year propagation was disturbed – magnetic storm first night, A=13 progressing slowly to A=20, so each km to the south count 10-times. It was frustrating to hear 9A1A of 9A1P or E7DX being only some 600 km to the south running (on more bands) when we heard just NOTHING. Probably similar could say ES5Q from ES5TV megastation hearing us working and they heard „NOTHING“. Of course there is no comparison to the stations in the west-southwest…..
Our poor 160m doing was not our gear but our bad organization… we should have there probably 10 mults more, but well, it would make no difference. propagation towards northern west coast on 10m from OK.
We had fun and that is all it is. Will hear you all in WPX once more. Looking at our score from 2012, it is pretty similar – much better 20m this year. Nice to see the increase of activity in BY, HS, 9M, YB. The summer propagation is always peculiar and I am always confused and you never really know what to expect. In 23Z on 40 (with our 5over5) should be dozens of „Ws“ strong like the „lions“ – it is so in. Saturday and in Sunday not a single one – even the venerable big guns are at most 339. Why – the SUN numbers are the same ? As always we had a good time – we are most happy with our result. Just looking – how our friends at EC2DX in incomparably better location – with much smaller antennas did…. Hope to hear you all again in the next one ! The sunspots go down – no doubt. We somehow missed at least 15 mults on 15 and 10 on 20 – our mistake. Anyway we did as expected. Had fun and looking forward to the next one.